So, the lucky winner is...Code-man swimming (breast stroke, I think). There were 8 other videos that I was planning to upload as well. Bummer. So, the computer has migrated up the stairs due to some unscheduled maintenance downstairs, and now it's much easier to do my summer-time blogging. I was very surprised to see these little guys out in the garden on Friday. Yup, we have green beans--I'm so excited! Speaking of little guys in the garden, Victoria (the monarch caterpillar) has come indoors to hang out with me, at least until we go on our next adventure--if she hasn't gone into her chrysalis by then, I'll put her back outside. I think Rex must have already gone off somewhere to begin his metamorphosis, since he's not on the milkweed plants anymore. So anyway, today (Sunday), while Code-man was gone, Sawblock and Logo worked on the tree fort a little bit. Bubby helped, too. Gotta love that tongue hangin' out! Meet my new friends, Rex (right) and Victoria. They're monarch caterpillars, hence the regal names. My husband was going to pull their home out of the ground (sometimes he gets these silly notions)--good thing I stopped him in time. I'm trying to decide whether to bring them inside to live with me--it's a bit touchy since we're not going to be around a whole lot in the next few months, but I really would like to see them undergo their transformations. I can't really take them with me, just in case there isn't any milkweed available where we go, and I can't just leave them because they need fresh food every day. This is exactly why we don't have pets! Anyway, I think Rex is probably going to make his chrysalis soon, so he would probably be OK. Here's the garden, looking somewhat jungley. You can see that the pumpkin plants are making a (slow) break for it. Here's our first tomato flower: We had Vacation Bible School this week. The theme was Camp E.D.G.E. (explore and discover God is everywhere). Today at the end there was a little program. One of the songs was the one that goes, "I will love the Lord with all my heart with all my soul with all my mind and with all my strength." Here's Logo really getting into it. Our last soccer games were Tuesday and Wednesday. I forgot the camera on Tuesday for Logo's last game, but here's a picture of Code-man tending goal on Wednesday. He didn't really need to be this intent on the game, since his team did a pretty good job of keeping the ball away from him--he did make a couple of good saves, though. We went camping at Wild River State Park this weekend. On Saturday we went canoeing--it was hot, hot, hot! Sunday we borrowed a GPS from the park and found their four part Geo Safari Cache in the rain. Each Minnesota state park has at least one multi-cache in it and many of the parks have GPS units to lend. Bubby is underwhelmed with excitement as we find the next set of coordinates. Logo found the cache! Here's a picture of our first bloom from the marigolds. The garden is doing well. We saw some buds on the green beans, pumpkins, and zucchini today, and the corn will definitely be knee-high by the 4th of July--it already is! Once again, I just have to say that there is something so satisfying about planting a seed and watching it grow. It makes me feel...connected, to be participating in this miracle. Here are some pictures from swim lessons--here's Logo doing elementary back stroke with his teacher. That's our 10X optical zoom at work--Logo's class is on the opposite side of the pool from where the spectators get to sit. Logo is doing really well in his lessons. And here's Code-man doing the breast stroke in front of the life-guard chair--we both agreed this was the best shot I got of him today, despite the bar partially obstructing his face. It still surprises me that this little kid can actually swim. By himself. With rhythmic breathing. Congratulate me: this is my 200th post. You may have noticed that it's been more than a week since my last post. That's because The Last Day of School happened. Now, the older two are not in school and the baby is not sleeping, so I do not have time to blog. The last day of school was fun. This year, after the school-wide picnic, the classes rotated together through several games--they called it HES Survivor. Very nicely done. and tree-climbing. There were presents, and we had a bonfire with s'mores, of course (notice the product placement--this is actually only half of the s'mores consumed that night, and believe it or not, I have seen more than this set up at one time before...) There was bike-riding (and crashing), and tractor riding, too. Notice that the boys are heavily armed, just in case some bad guys jump out of the woods. There was, however, no cake, and no "Happy Birthday" singing, hence, no pictures of such. All in all, it was a great time. I hear that we're going to do it again next year. You know how some mommies complain that they can't go to the bathroom by themselves anymore? Well, my precious Bubbalicious has taken it one step further. I can't take a shower by myself anymore (that is, unless I want to listen to a Bubby crying and trying to open the shower door for the duration). And the Bubby (he's so special), likes to center himself over the drain...right in the middle of the shower floor. We tried this when we went camping over Memorial Day weekend, and Code-man and Logo have both asked for it since--amazing (they rarely like the same things). Pour 2 T dressing over chicken in resealable plastic bag. Seal bag; turn to coat chicken with dressing. Refrigerate 30 min. to marinate (since we were camping, I froze it at this point to marinate while it thawed in the cooler). Heat grill to medium heat. Remove chicken from marinade; discard marinade. Thread chicken onto 4 (we used 6) skewers. Grill 6 to 8 min. or until done, turning occasionally. Add bread to grill; cook 1 min on each side or until toasted on both sides. Rub toast with garlic; brush with oil. Arrange toast and lettuce on platter; drizzle with remaining dressing. Top with chicken skewers and parm. cheese. There you go: a delicious, balanced, fast, easy to prepare, inexpensive meal. Yum. The boys (sans Caleb) went camping this weekend and tell me they had a good time. I saw the forecast (high of 50 and rainy all day) and decided to opt out of this one. They say they went on lots of hikes and checked out the river. Unfortunately, they forgot the camera, so you'll just have to imagine them exploring caves, standing on bluffs, climbing cliffs, etc. So guess what I'm doing for my birthday! It's going to be so much fun! I'm having several of my oldest son's best friends over for a sleepover/camp-out. And they're going to bring presents--for him. We're going to eat brats and green stuff (when Cody said he wanted "green stuff," I thought, wow, the kid wants to serve vegetables at his party. It was a proud mommy moment, until I realized that he really wanted that pistachio fluff stuff) and have a bonfire (if it ever stops raining) and eat 4 s'mores each (that's what Code-man tells me, anyway). I'm sure we'll all drink at least two cans of sugary soda, too (well, all of us, except for me, of course). And we're going to ride our bikes and squirt each other with water guns. Maybe I'll even splurge and get some water balloons. And we'll stay up late (again, except for me) making lots and lots of noise. It's going to be great! So yesterday I was blogging about being in control, or at least thinking that we're in control, and I wanted to expand on that just a little bit. So many of us like to be in control, if not of everything, than of as much as possible. One of my best friends is getting a crash course right now in realizing that she can't control everything, and it's kind of tough on her--she's a structured, scheduled, planning type of girl. But I am reminded that trying to maintain our control, or our illusion of control, can be exhausting, especially when, as things do, everything starts falling apart. Jesus said, "Come to me, all you who are weary and burdened, and I will give you rest." (Matthew 11:28) My friends, it's not just that you're not in control, but you can give it all up, your need to think you're in control, give it to Jesus, and rest in him. Rest. What a precious gift. 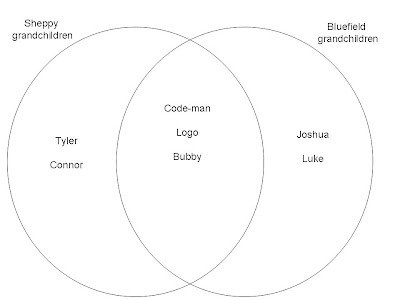 Just in case you think it's a little geeky of me to make a venn diagram of our children and their cousins, I would like to point out that at least one other math-minded person in the family thought about it, too, and my brother was figuring probabilities of 5 boys and 7 boys in one family. So, I guess my point is, I'm not the only one! I made BLTs for dinner last night--I was inspired by the "what's for dinner tonight" feature in our local grocery store. I was so impressed with myself for actually cooking a meal for the family while Hubby was out of town. Everything was going well: I put Logo in charge of cutting the tomatoes and Code-man was handling the toast. Everything was well in control, and then, I realized I had forgotten to put the grease catcher onto the griddle and the bacon grease was pouring out onto the top of the stove. The gas stove, of course! Ug. How many times in our lives do we think everything's going well, everything's well in control and then we realize it's not? I think the flaw in our thinking is that we think we have everything under control. When you think about it, how much in our lives is really in our control? Not a whole lot. We can only control our reaction to our circumstances, not the circumstances themselves. In the past few months I've had two friends comment to me that while life is good, they'd been having emotional difficulties because it just wasn't what they had envisioned. We all do that: we dream and set goals and think, next week, next month, next year, next decade, this is what I'm going to be doing, what my life will look like. And that is for sure not a bad thing to do. I'm sure we've all heard that saying, "if you aim at nothing, you're sure to hit it." The problem comes when we shift from knowing that God is in control to thinking that we are, that we can be. And after we make that shift, we start to put our confidence in our plans, rather than where it should be, in the loving hands and loving plans of God. I inventoried our children's clothes. I went through all of the boxes (of which there are quite a few) and counted and wrote down how many of each type of each size of clothing we have from 3T up to 16. I then put all the information into a table in Microsoft Word. Is that a bit excessive? Am I a little nuts? Well, yes and yes, I think. Let me tell you why I did this. By now you know that I hate to waste money and I hate to pay full price for anything, so any time I'm in a clothing store, I check out the clearance racks. I also go to thrift shops, and the occasional garage sale. And I'll be standing there, and there will be, for instance, T-shirts for $1. And I'll think to myself, now what sizes of T-shirts do we need more of? And I won't know. So I either won't buy any, or I'll guess, and sometimes guess wrong. Now, you might say, it's only a dollar, who cares if you buy one and it turns out you already have 15 in that size? Because those dollars add up, my friends. When Code-man was little, I could keep all of the clothing information in my head. It was pretty easy, considering I only had one child, and pretty much only had the clothing that he was currently wearing and those he had grown out of. Adding Logo (MC) to the mix made it slightly more difficult to keep that info in my head, but I had a handle on it. Enter Bubby, and now all bets are off. Witness the list in action: yesterday I'm standing in Target and I see swim trunks for $2. I think to myself, surely we need some size 8 swim trunks. Probably some 4/5 and 6/7 as well. I whip out my trusty list, find the swim trunk column, and discover that we already have 3 pairs of size 8 swim trunks, 2 of size 6/7, 1 size 4/5 and 1 size 5. I think that's enough for now, and I did not spend $6 on swim trunks we didn't need. I'm not sure why I'm telling you this. Maybe because I'm proud of my solution to a pesky problem. Maybe because I think I need help. Maybe because I think my experience will help you in some area of your life. Who knows?